The SouthEast Alabama Rocketry Society held their April launch on the April 12th in Samson, AL. The April 5th launch was cancelled due to rain. This launch was threatened as morning showers were expected. Therefore we planned a late start at Noon. I arrived in Samson at 11:00 and the rain was pouring. I was very worried the launch was a scratch but, we gave it 30 minutes and the rain began to trail off. But who would come with the iffy weather? Enough for a great launch it turned out. We had two new members Tom Macpherson and his wife Penny & Daymon Campbell and his wife Pearl. These folks are very enthusiastic. Tom had many flights and Daymon plans to bring rockets next time. We had most of the regulars including Bill Bosley and Reese. It was nice as the new wives were socializing as well as Bob Stetson’s and Jon Ward’s Daughters along with the other kids. The event was Peep Spot Landing? The target was about 60 feet from the pad. 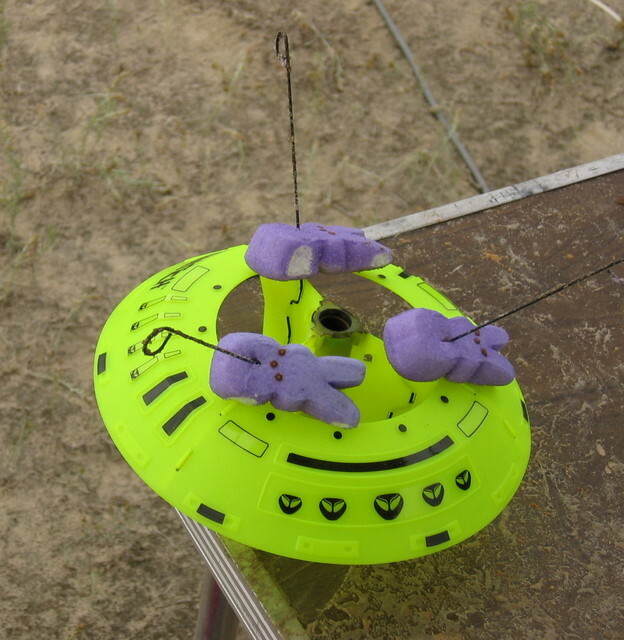 The peeps were being lofted with great determination to hit the target. Various strategies developed including picking smaller motors and pointing the rod toward the target. There we about 50 Peep flights. Tom Macpherson had the closest peep to the target which was about 10 feet. Tom got the first draw from the special prize pool donated by Sunward. The remaining Sunward prizes were given out to those participating in the peep event. The weather continued to improve with the clouds lifting and we had blue skies by 5 o’clock. This was very timely as Jon Ward and John Hansel made several L flights from John Hansel’s tower on the away cell. Then Chris Short made the first N flight at SEARS on an N2020 in his 15 foot War Eagle rocket. The flight went to 6500 feet. Sarah Gifford made her Level 1 Cert Flight at the end of the day. Congrats Sarah! So after being doubtful that the launch would even be a go, I believe it was one of the best ever. Funny, I keep saying that after every launch. The May launch has been moved from May 3rd to May 10th. I hope you can make it. Click here for more pictures and here for videos. 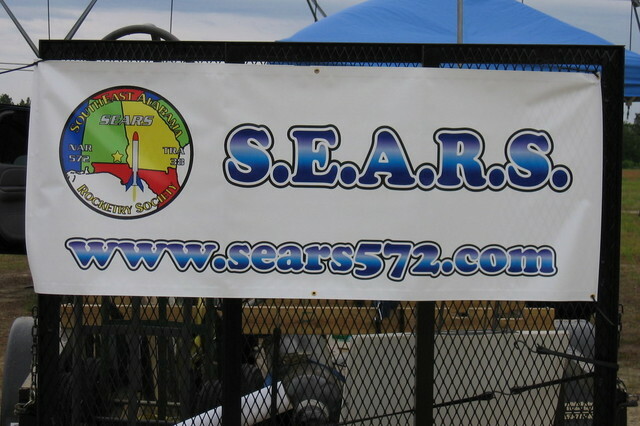 The next SouthEast Alabama Rocketry Society (SEARS) launch is May 10th 2008 in Samson, AL. The event is Upscale Day. Use a green flight card for any upscale of a rocket kit and you will entered for a draw from the prize pool. Cliff Oliver contacted Graphics-N-Stuff and had a banner made for our club. It turned out fabulous! Graphics-N-Stuff also did the body wraps for Greg and Cliff’s L3 rockets. The SEARS Logo was created by Tom Rackers a while back. We will launch in Samson, AL. Setup is at 11:30 and we will start flying at 12:00. The waiver will be open until 7 PM or when we are done launching. We will have the Sunward Peep Spot Landing Event and have the prizes will be drawn at 3:30. As always stay in the road on the sod farm and park in the designated area. The sod will be wet and we do not want to make any ruts. Due to the heavy rains expected on Saturday, the April 5th launch is cancelled and rescheduled to April 12th. The Auburn Team should workout a time with John Hansel if they want to launch before April 12th. Sorry our run of excellent weather ran out. 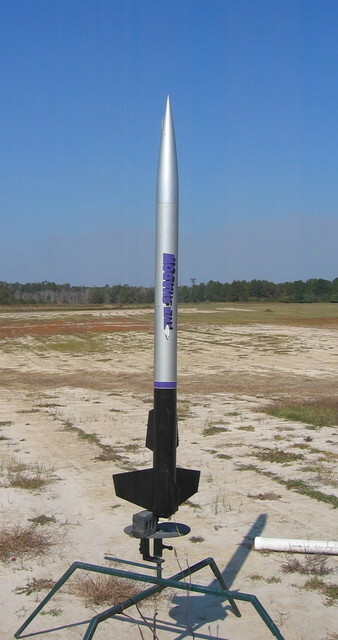 You are currently browsing the SouthEast Alabama Rocketry Society weblog archives for April, 2008.